One of the reasons we went to Minnesota over the summer, besides to visit my husband’s family, was to take a day trip over to Isle Royale National Park. 2016 was, after all, the 100th birthday of the national park service, and what better way to celebrate than to visit one of the most difficult to reach, and least visited national parks. A day ferry transports passengers in and out of Grand Portage, Minnesota for a scenic cruise out to Windigo Station where guests are given 4 hours to hike around the various trails and paths around the area or participate in a Ranger led walk or participate in a Ranger talk. During our time on the island, we were one of the few in our group to have been able to see one of Isle Royale’s most famous residents, some of the more than 1,300 moose that occupy the island. One of the items that makes Isle Royale so fascinating is the relationship between the wolves and moose that occupy the island. To have traveled all the way out there and seen the moose was spectacular and amazing and made the journey to get there worth it. At the end of the all-day excursion to get out to the island, we were starving by the time we made it back to Grand Portage. We agreed to drive back down to Grand Marais and see if we could grab a late lunch. I really wanted to dine at a specific restaurant we had seen the day before when we drove through Grand Marais. I’d never been to this particular restaurant before, heck, I’d only ever stepped foot in Grand Marais the evening before, but I’d heard of this restaurant time and time again from my sister-in-law who comes here often and calls this place her favorite restaurant. 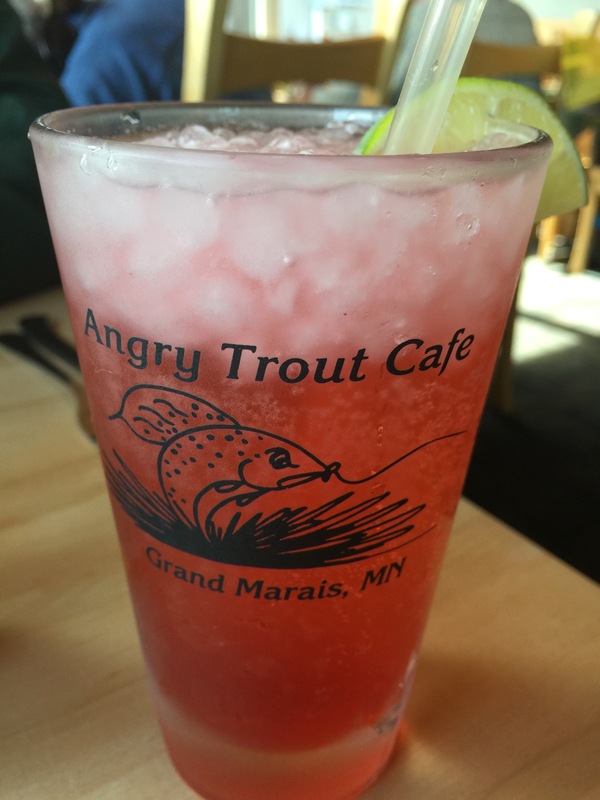 Located in an old fishing shanty at the end of Grand Marais Harbor, this seasonal restaurant, which is only open from May through October offers diners indoor and outdoor seating with a gorgeous view of Grand Maria Harbor and the North Shore of Lake Superior just beyond that. Specializing in the finest and freshest local ingredients, the Angry Trout proudly serves local Lake Superior fish which I was just dying to taste. After a morning spent out on Lake Superior and hiking around an island in the middle of nowhere, a plate of fresh, local seafood sounded perfectly divine. As you walk into the restaurant, a colorful chalkboard right out front announces the days fresh fish, soups and special dessert offerings. 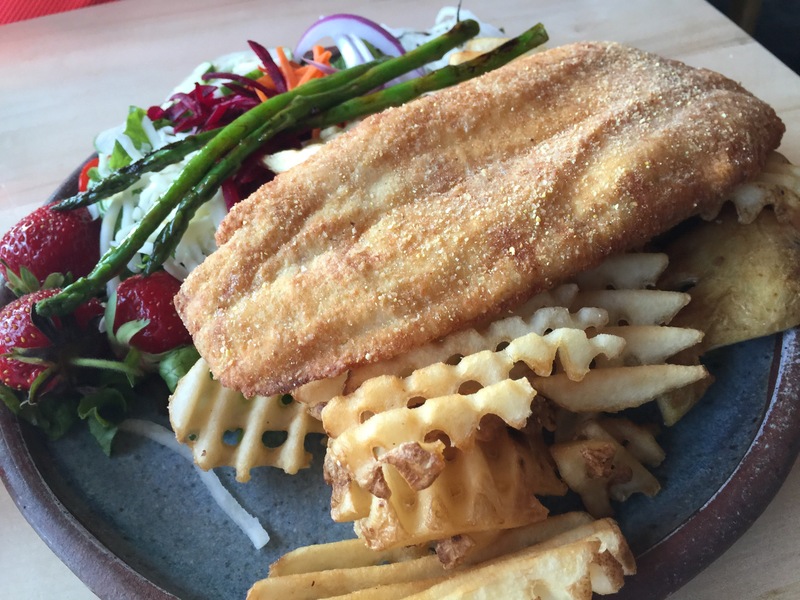 Serving local, fresh fish caught daily by the local fisherman, the Angry Trout Cafe strives to operate under the concept of sustainability, purchasing and serving locally caught fish, organically grown and local produce from local farmers and hand-harvested local wild rice. Once we entered the restaurant, we opted for a seat at a table inside, just next to the window so we could get a great view of the harbor outside and the late afternoon sun shining down on the water. By the time we sat down, my husband and I were both pretty famished. We each decided to start by ordering some drinks to quench our thirst. 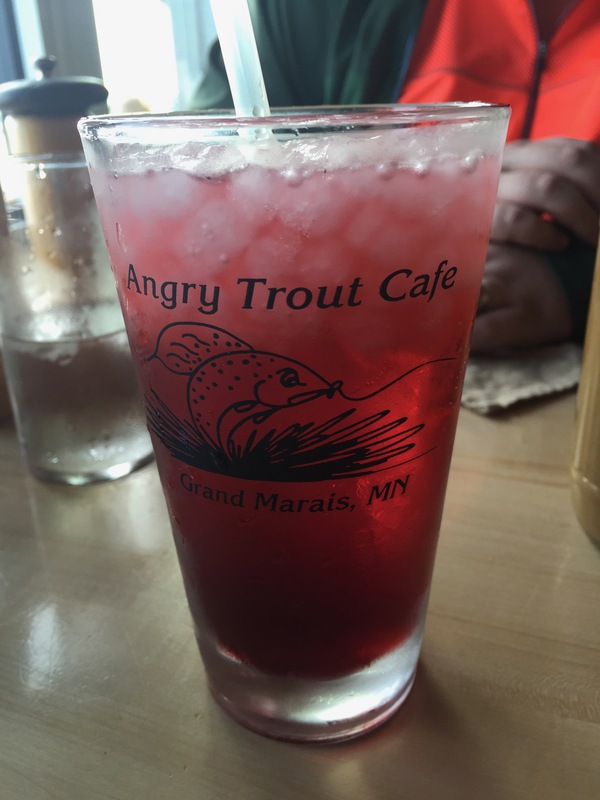 The Angry Trout Cafe offers up a few homemade sodas, which we decided to try out. I ordered the strawberry-lime soda, while my husband decided to go with the cherry-vanilla soda. Truthfully, I think my husband originally wanted the strawberry-lime soda, but once I decided to order that, he decided he wanted to try something different. I loved the strawberry-lime soda, it was absolutely refreshing, a little sweet, and a little tart. The addition of the lime twist was the kicker to the soda that gave it that refreshing flavor that kept me going back for more. On a warm summer day, this was the perfect drink. For my husband, he really enjoyed the cherry vanilla soda. He said he could taste both the cherry and the vanilla in each sip of the drink and it was a terrific combination, slightly sweet and slightly fruity. Again, this was a refreshing drink that hit the spot. After looking through the menu, my husband and I both decided to order the fish of the day. 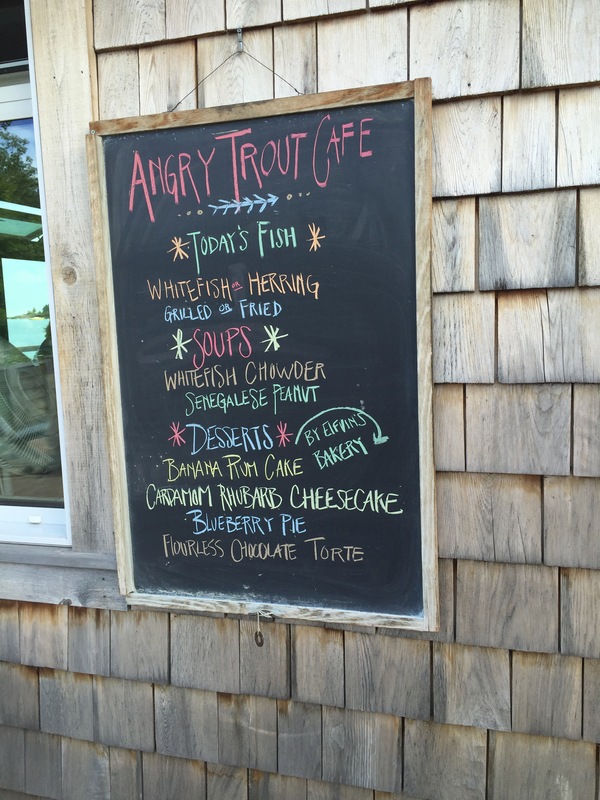 If this was The Angry Trout Cafe’s speciality, we might as well give it a spin. Today’s fish choices were whitefish and herring, we both went with the whitefish option. For my meal, I chose to have the whitefish grilled. The whitefish fillets are skinless, boneless and based with a simple sauce of olive oil, fresh lime and tarragon. 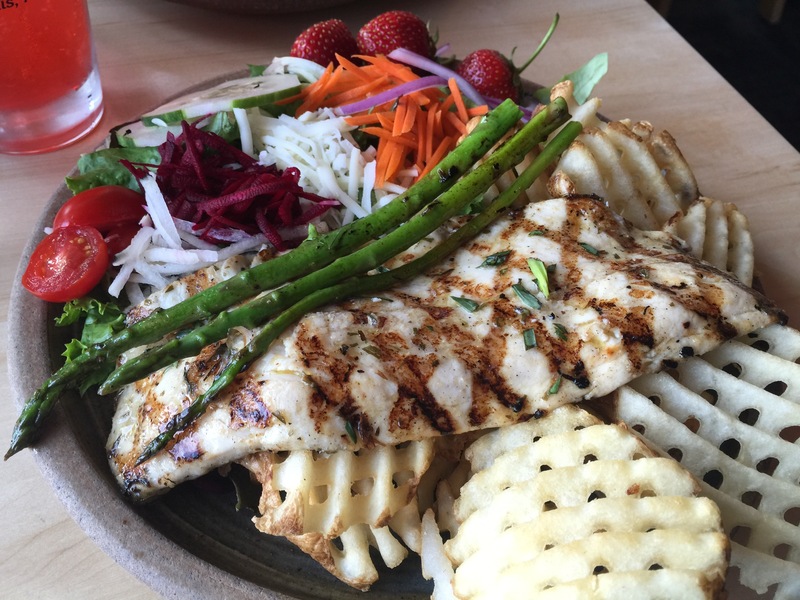 The meal comes with a fresh side salad and a choice of sides, for which I chose waffle fries. Let’s start with the side salad, it was so fresh and delicious from the cheese to the julienned carrots to the beets (which I generally hate), even down to the cherry tomatoes. For some reason, the salad was like a breath of fresh air, the ingredients were so fresh, it literally tasted like it was just picked from the garden that morning. The fresh local strawberries on the plate were a pleasant surprise and the grilled asparagus was a fantastic touch too. Everything just tasted so clean and fresh. The waffle fries were amazing. They were perfectly crispy on the outside and tender and hot on the inside. The fries were lightly salted and just perfect. But, let’s get to the grilled whitefish. I honestly don’t think I’ve ever had more delicious fish in my life. The fish was perfectly grilled with beautiful grill marks on the fillet. The flavor of the olive oil, fresh lime and tarragon was a perfect complement to the flaky white fish. It was plain to see, and taste, that this fish of the day was extremely fresh and even tastier. 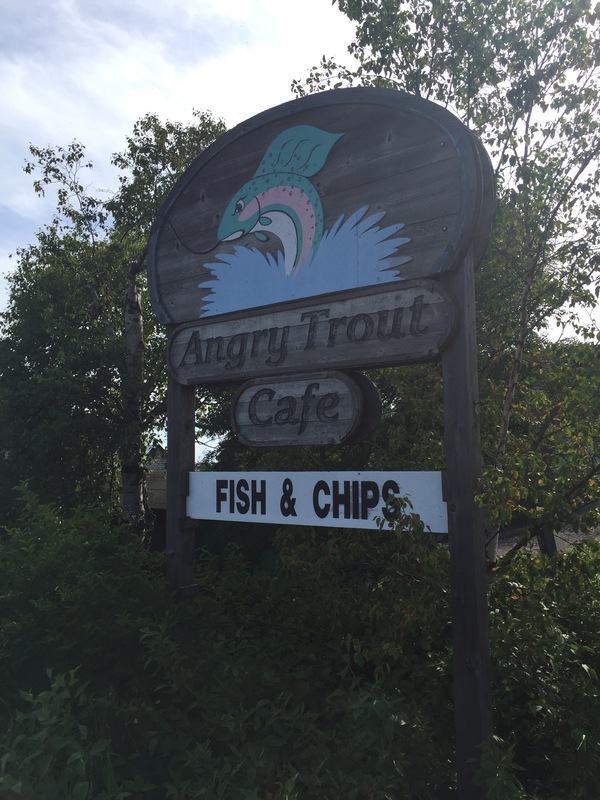 I walked away from The Angry Trout Cafe singing the praises of the food and jealous of my sister-in-law who gets to dine there all the time, it’s no wonder it’s her favorite restaurant. While I took the grilled fish of the day, my husband decided to order the deep-fried preparation of the whitefish. Described as a favorite way to prepare this local specialty, the whitefish is lightly breaded and fried to a crispy golden brown. Again, much like with my meal, my husband also decided to choose waffle fries for his side dish for his meal. 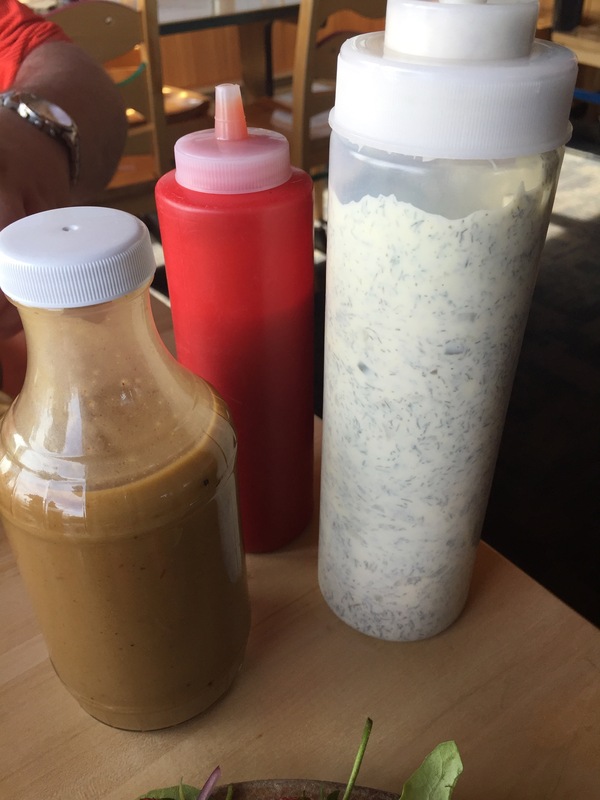 With each meal, we’re also given a bottle of homemade tartar sauce for the fish, ketchup for the fries, and homemade salad dressing for our side salad – in this case, we both chose the balsamic vinaigrette. For my husband, I think he was as in love with the food as I was. When our plates arrived at our table, we basically devoured our food without saying a word to each other. My husband loved his deep-fried whitefish just as much as I loved my grilled version of the same fish. The whitefish was perfectly fried and crispy, the breading wasn’t too thick, but yet stayed on the fillet perfectly without falling apart. The seasonings were perfect and light and really brought out the amazing flavor of the fish itself. Much like my plate, my husband completely cleaned off his plate. This food hit the spot and was exactly what we were both looking for. The Angry Trout Cafe lived up to all of the high praise my sister-in-law sang for years before my husband and I got a chance to try it for ourselves. The setting on the harbor, the view, the service, and the food were all incredible. The meal we had at The Angry Trout was some of the best food I’ve ever tasted, so fresh and delicious. Months later, I still think about how amazing good the whitefish I dined on was, and wishing that somehow, someway, I could transport The Angry Trout Cafe closer to home. The restaurant isn’t just a star in Grand Marais, but for any fish lover, it’d be a star no matter where you loved or where you came from. Glad you enjoyed it. It was fun to read about your visit. For the many times I have visited and the small menu, you tried some things I have not had. Neither Greg nor I have had the waffle fries, nor the vinaigrette salad dressing. If you ever make it back, the fresh fish of the day sandwich is to-die-for for lunch, and I love the wild rice, too! Even the soda is good there, and I’m not a big soda drinker.